The EIPL HGR1500 Dehumidifier is the base model from the new family of High Grain Refrigerant dehumidifiers. These high capacity, low amp draw units are the future of dehumidification, providing the ultimate in extraction for minimal running costs. The two stage cooling ensures high capacity drying even in low humidity applications. Two stage cooling with supplementary “Air to Air” heat exchange, High Static Backward Curved Fan, High efficiency - Low Amp Draw Rotary Compressor, nlet and Outlet on the same face, Internal High Lift Condensate Pump, Temperature Sensitive Defrost control for optimum performance, Reverse cycle defrosting feature which automatically melts away frost buildup providing effective operation at low ambient temperatures, Washable Air Filter. Humid air is drawn into the dehumidifier and passes through an “Air to Air“ Heat Exhange. This process precools / drys the air, before being passed over the Evaporator coil, where any moisture present will be removed. This cool dry air then passes back through the Air to Air Heat Exhange, in the opposite direction, providing the cooling for the incoming air. After passing over the Condenser Coil, which reheats the air, the Warm “Super Dry Air” leaves the dehumidifier. The EIPL HGR1500 produces drier air than a standard refrigeration type dehumidifier. This is only possible with a secondary precooling method, in the HGR1500 case, an Air to Air Heat Exchange. The refrigeration system of the HGR1500 is fine tuned to ensure the leaving air is at it’s lowest possible relative humidity, thereby ensuring the maximum drying performance, for lowest running costs. The high capacity backward curved fan will maximize air delivery over long distances. Whenever there is a need for fast dependable, energy-efficient drying, EIPL can provide the answer. The high efficiency rotary compressor ensures the maximum extraction with the lowest running costs. EIPL is a recognized world wide supplier of flood restoration drying equipment. We offer a variety of dehumidifiers and air movers to remove water and assist with drying areas after water damage. Following a flood, whether it is in your basement or office, it’s vitally important to restore the damaged area to good order as soon as possible to protect your health from microorganisms, mold and bacteria that may grow and ultimately prevent further damage. Whether it is a flash flood, hurricane, heavy rains or water main break, EIPL has the equipment to handle the harshest environments and assist with proper restoration. EIPL dehumidifiers are effective solutions to environmental control problems. 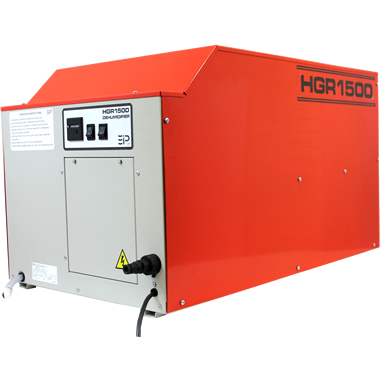 The HGR1500 dehumidifier, with it’s two stage cooling process and temperature sensitive defrost control, ensures optimum performance throughout the unit’s full operating temperature range. Moisture is removed from the air through an efficient refrigeration process. The fan draws the moist air through and “Air to Air” heat exchange, where the incoming air is pre-cooled. The air is then drawn through the evaporator coil which further cools the air below it’s dew point. Moisture forms on the evaporator coil and is collected in the condensate tray. The cooled air then passes through the hot condenser coil where it is reheated using the same energy removed during the cooling phase, plus the additional heat generated by the compressor. The air is, therefore, discharged from the dehumidifier at a slightly higher temperature with a lower absolute humidity than that which entered. Continuous circulation of air through the dehumidifier gradually reduces the relative humidity within the area.